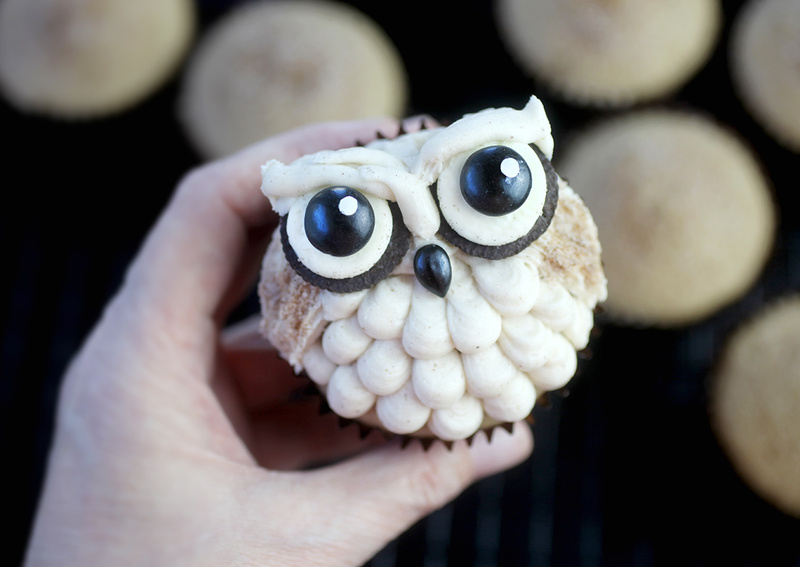 Hoot Sweet! 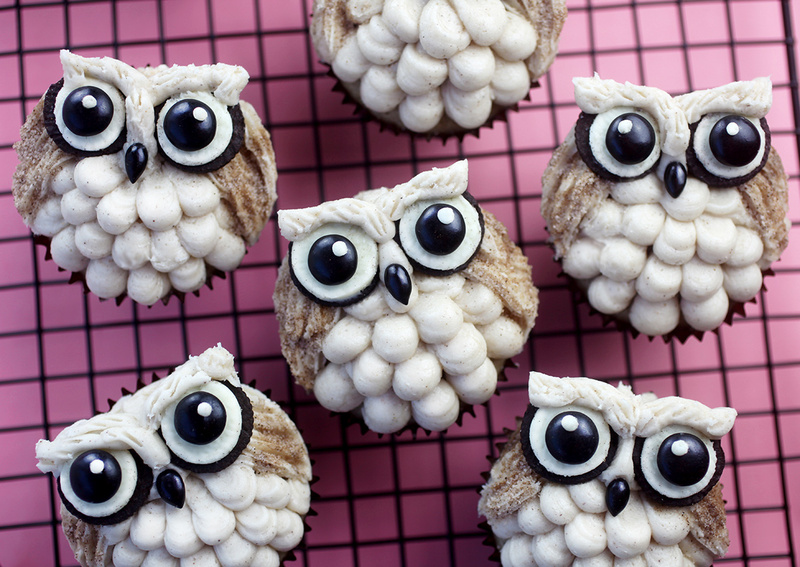 These cupcakes are owl-out adorable with their oreo eyes and plumes of buttercream. 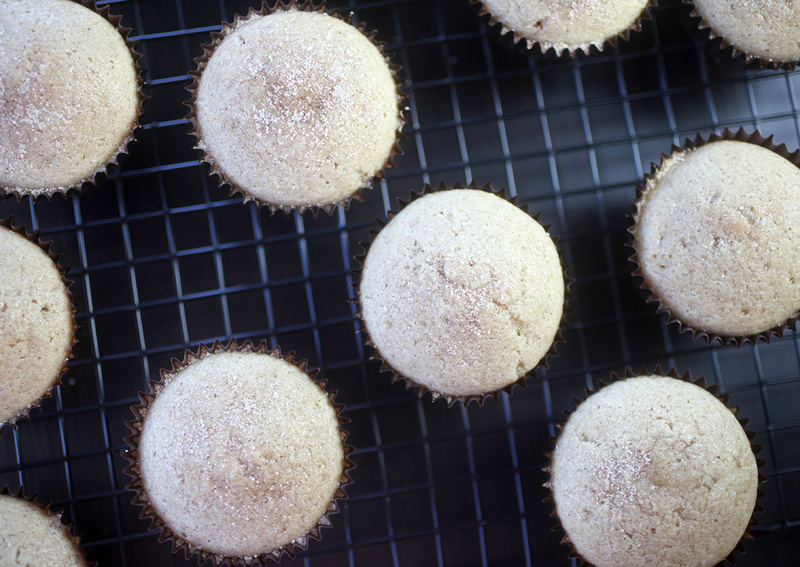 And these cinnamon sugar cupcakes don’t hurt either. 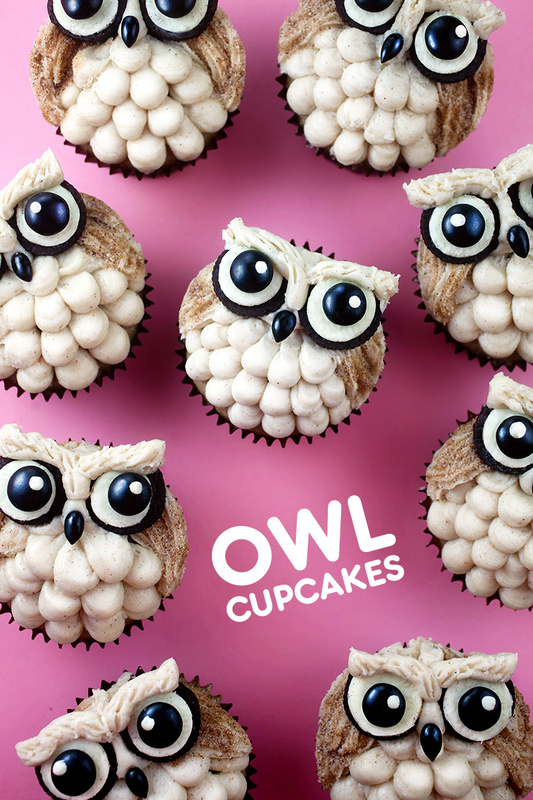 They’re the perfect canvas to decorate with just buttercream and a few edible add ons to make little owls. Want to see? 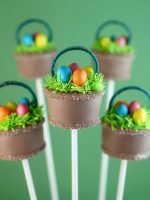 Start by using a small round #10 decorating tip. Pipe about 5-6 big dots of buttercream around the bottom edge of the cupcake top. Pipe and pull the frosting into a thin layer. Then pipe another row on top of the first row. Continue piping rows of dots into somewhat of a triangular shape. 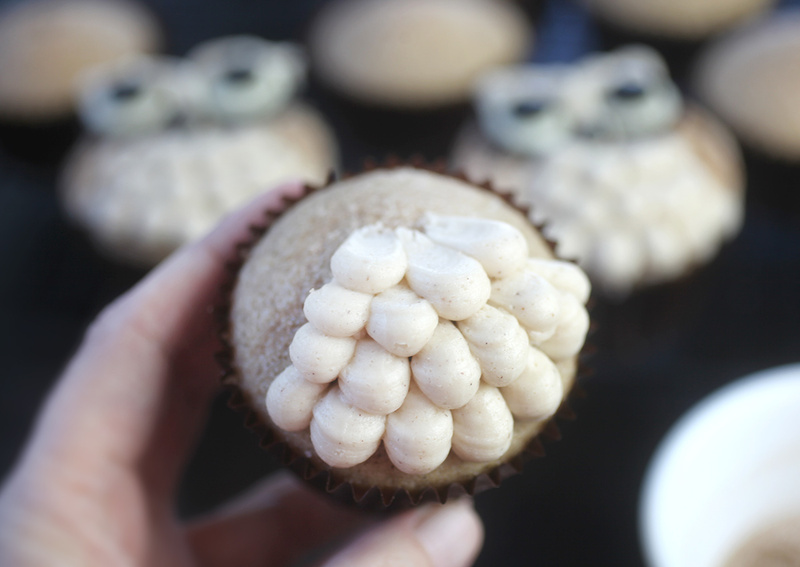 For the wings, use a #18 tip to pipe frosting on either side of the owl’s chest (covering the rest of the cupcake surface) and then sprinkle cinnamon sugar over the wings for texture. Now it’s time to put the faces on. Yep! We need some big eyes. 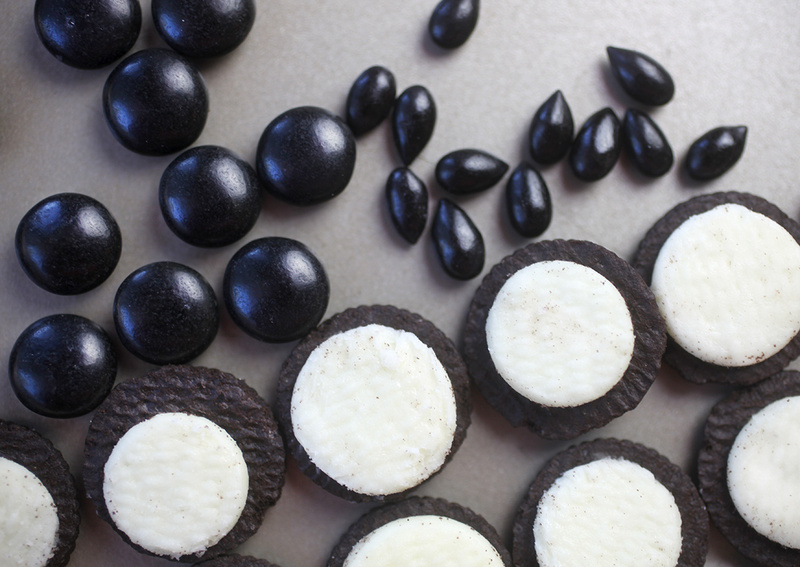 They’re made using Oreo Minis. And if you’ve ever opened a bag of these and separated the cookies, then you know they are dappled with cookie crumbs. 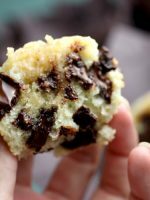 To fix that, you can chill the cookies and then use a toothpick to gently brush or scrape off the crumbs. Much better! 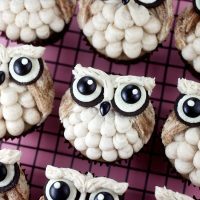 Use black candy gems or M&M’s for the owl’s pupils. 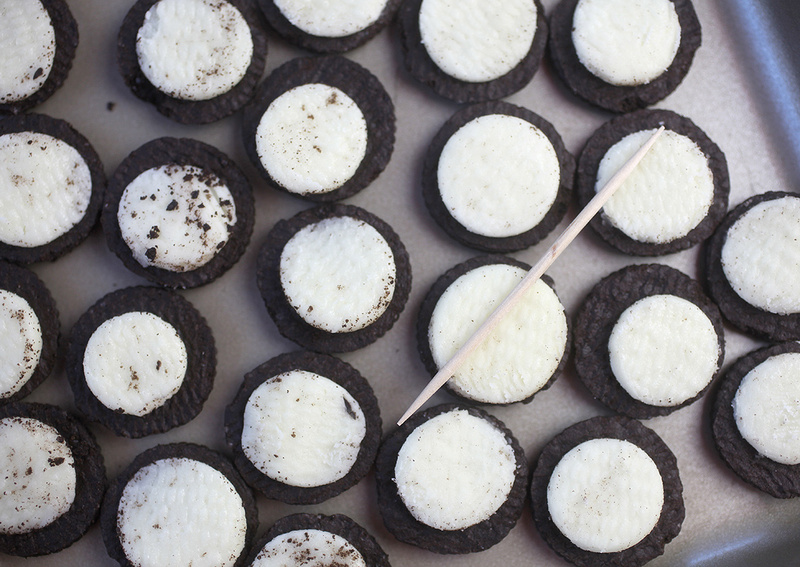 Just press one into the middle of each cookie creme center. 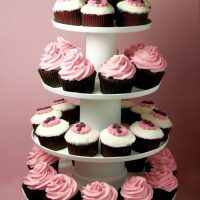 To bring it all together, use the round decorating tip again and pipe a line of frosting down the center of the cupcake, starting from the top row of chest feathers toward the top of the cupcake. Then press the cookie eyes in position on either side of the piped line and add a black sunflower seed for the beak. 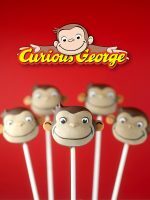 Finally pipe a buttercream brow over the top of the two cookie eyes and use a toothpick to add texture. Preheat oven to 350 degrees Fahrenheit and line cupcake tray with paper liners. Sift flour, baking powder, cinnamon and salt together in a medium bowl and set aside. Add eggs, mixing each until just combined. Add vanilla extract and mix. Slowly add flour mixture in three additions, alternating with milk in two additions. 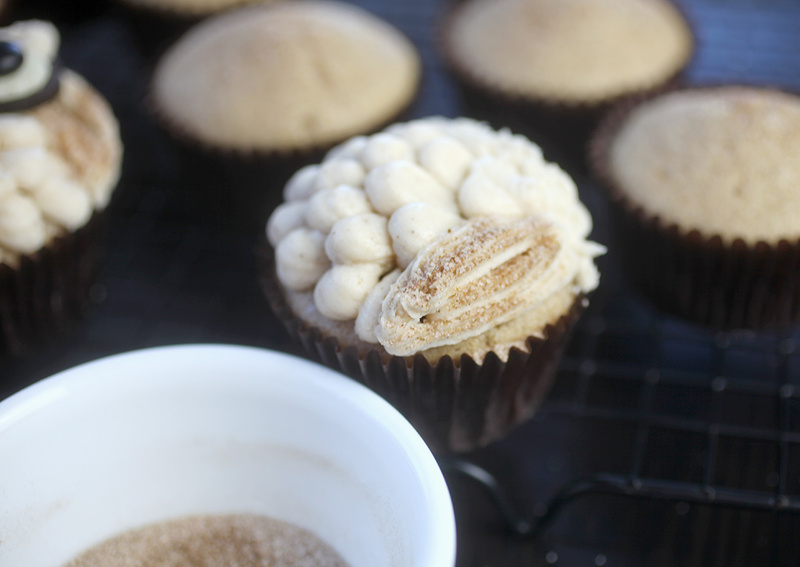 For cinnamon sugar frosting: Beat butter and cinnamon on medium speed until combined. 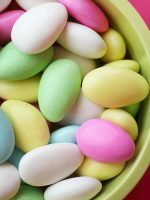 Add confectioners sugar in several additions starting on low and then increasing speed to medium. Scrape down sides in between each addition. Add vanilla and mix until combined. Add 1-2 teaspoons of milk until desired consistency. 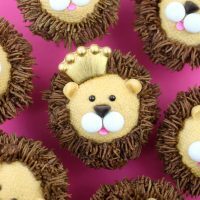 These cupcakes are adorable!!! I have to make it soon, so cute ??? 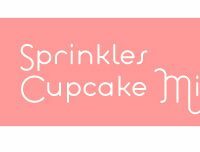 I am always so impressed with your cupcakes. These owls are incredible! I love ever single detail including their big cookie eyes. These are adorable. Sometimes I forget that we can eat the treats you make! I know. Sometimes I just want to stare at them for a while. Wow! As I always say, “Angie, you are amazing!” I don’t know how you do it, but I look at a blank canvas and I see a blank canvas. However, you are always coming up with new ideas that just blow me away. I guess what I love so much is the personalities you put into your designs. 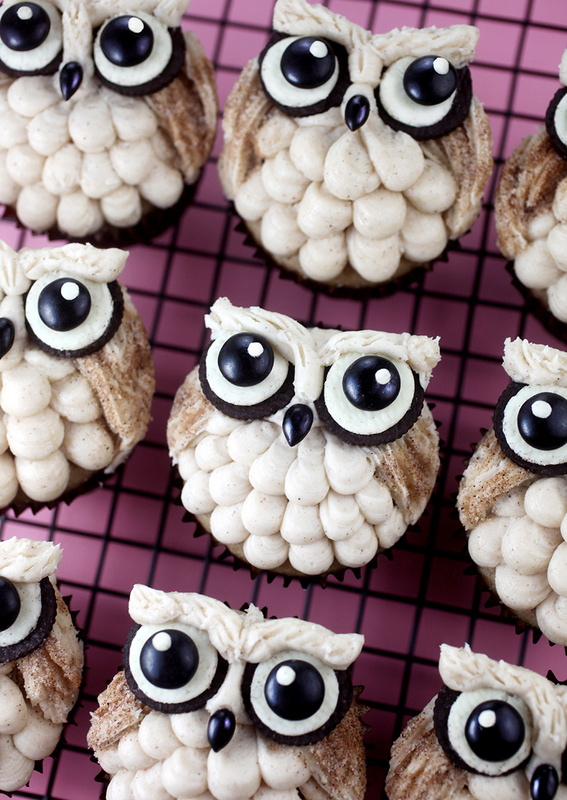 Thank you for sharing these beautiful, amazing Owl Cupcakes with us! TOTES ADORBS!!! MY FSVORITE! BRILLIANT! 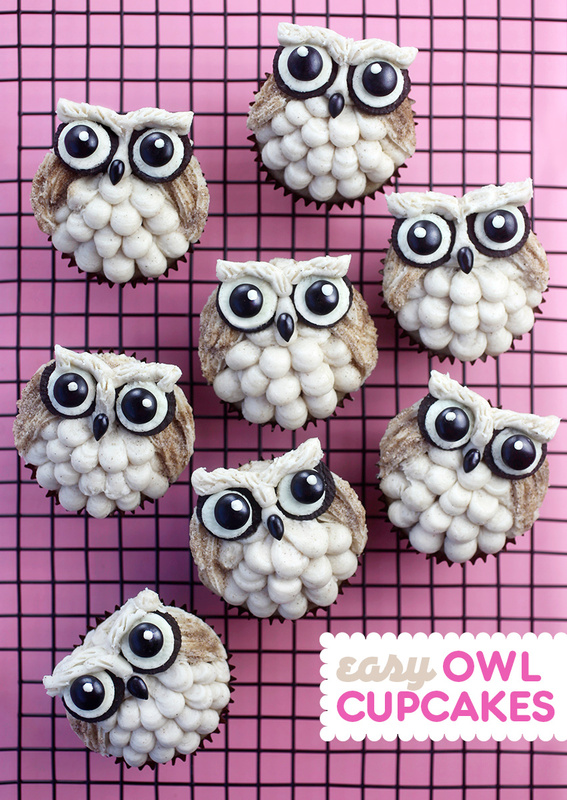 These are a hoot — so cute!!!!! Those owls are so beautiful! I love them! Can’t wait! One minor note, the recipe says to add sugar to the flour mixture and sift, then it says to cream it with the butter. I think it may be a typo to add it to the flour mixture. Always love your recipes. Thanks for the decorating tips too! Thanks so much. Just fixed it to be salt. OMG! 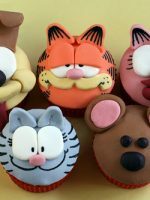 You did an amazing job with these adorable cupcakes, Angie! I love them so much! They look so realistic. 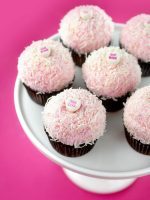 This would also be nice for Valentine’s Day. 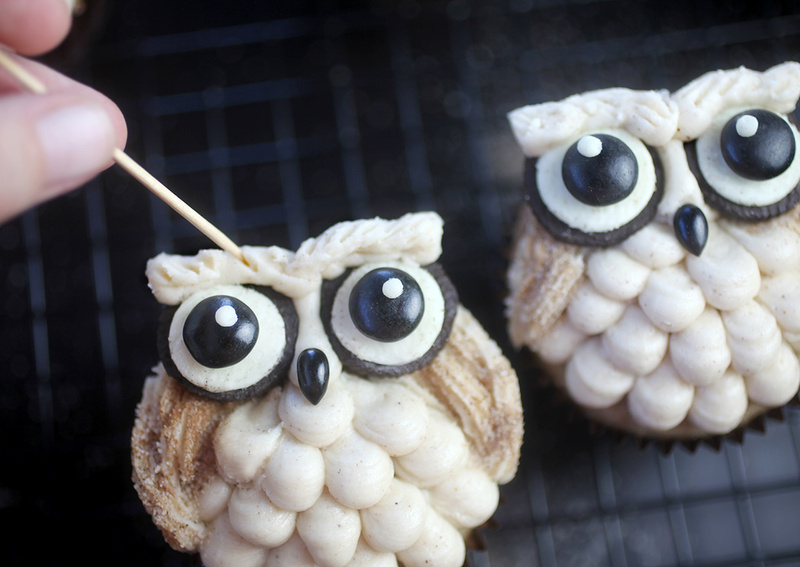 I might just put heart-shaped candies or jellies for the owl’s eyes. I love these! So cute! 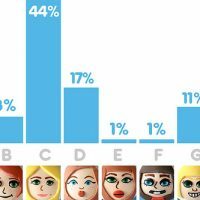 Where did you get the noses / how did you make them?